Sheriff Toulon spoke with students about what the Sheriff’s Office does to help the citizens of Suffolk County. Sheriff Toulon spoke with students from Medford Elementary School. 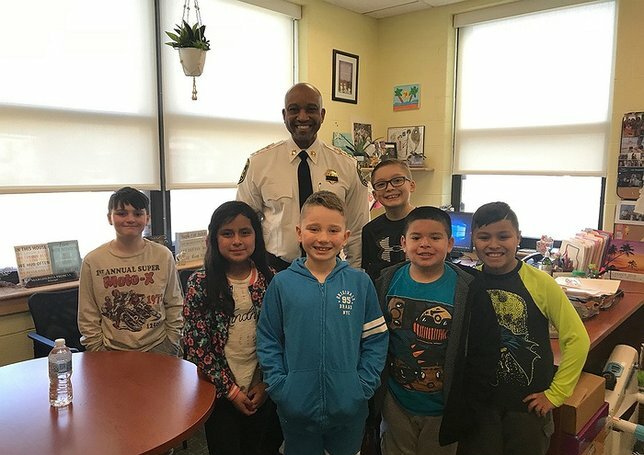 Patchogue, NY - February 11, 2019 - On Tuesday, February 5th, Suffolk County Sheriff Errol D. Toulon, Jr., payed a special visit to the Medford Elementary School to talk with 200 students in the 4th and 5th grade class about making good choices and about what the Sheriff’s Office does to help the citizens of Suffolk County. He also answered questions that the students had about working in law enforcement, what he likes best about being the Sheriff, and how they could grow up to become the Sheriff. Sheriff Toulon told the students, “Even when things seem impossible, keep pushing through, because YOU CAN DO IT if you really put your mind to it.” He told them about how he faced his own struggles growing up in the Bronx and even as an adult he faces struggles, but anything is possible if you put your mind to it and stay focused on your goals. Subject: LongIsland.com - Your Name sent you Article details of "Suffolk Sheriff Errol Toulon Visits Medford Elementary School"